BoomSonar Suite has all the tools needed for taking real-time action, preventing crises, and managing your brand. Get daily summaries, Twitter Trending Topic alerts, influencer notifications and crisis alarms. 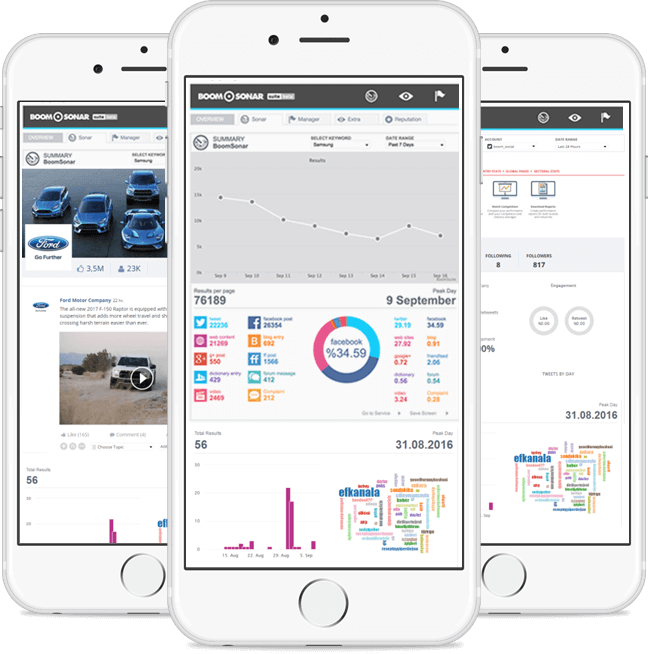 Tools for every marketer, designed for 24/7 monitoring! Never be late to deal with a crisis! BoomTools provide the tools needed for crisis prevention and management. Get daily summary emails to see the greater picture, Twitter Trending Topic alerts for marketing campaign tracking, Twitter user monitoring to better monitor influencers, and crisis alerts for identification and immediate containment of crises. All alerts, notifications and warnings can be shared with your whole team, and others. Influencers might Tweet negatively about you, multiple users may team-up to create a Trending Topic, a Facebook post might go viral, a negative news article may be published by numerous websites. BoomTools provide you 24/7 monitoring of these dangers, helping you to be ready for crises and take action. Get notified when anything extraordinary happens! Preparing daily, weekly and monthly online activity summaries is a tedious work. BoomTools helps you to get the highlights of the day in a single, well-designed e-mail for easy tracking and reporting. Select your reporting frequency, choose the content channels you want, prepare your e-mailing list and let the results come to you! It’s important for a brand to know the trends, and it’s critical to see if a topic about the brand is trending on social media. 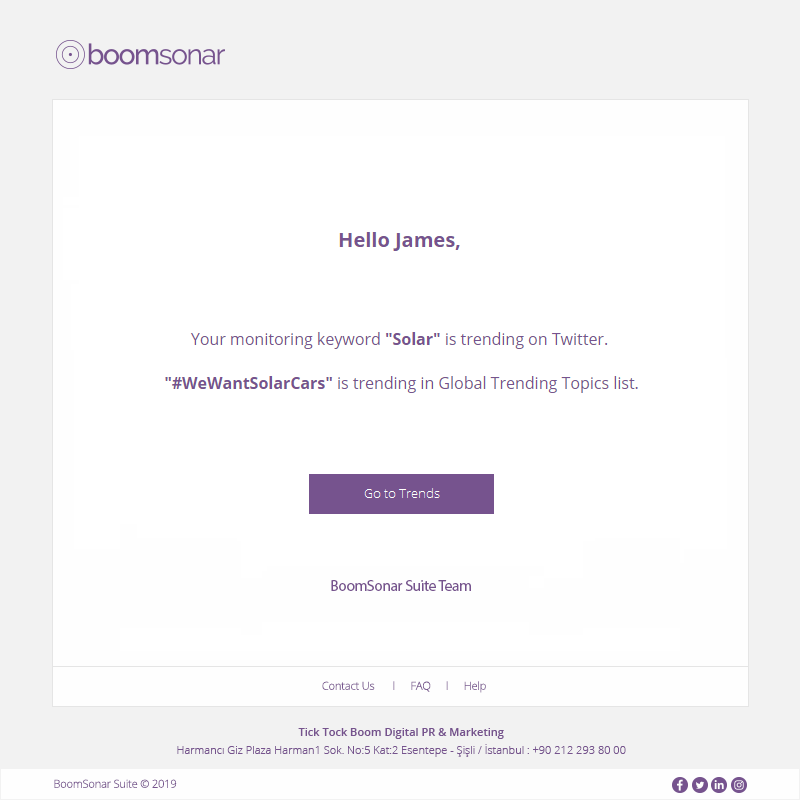 BoomTools monitors the Twitter Trending Topics list on multiple locations, and can alert you when your keywords are in the Trending lists. The most comprehensive solution for brands and agencies! Try the BoomSonar Suite demo, start real-time monitoring, data analysis, and reporting on all channels. 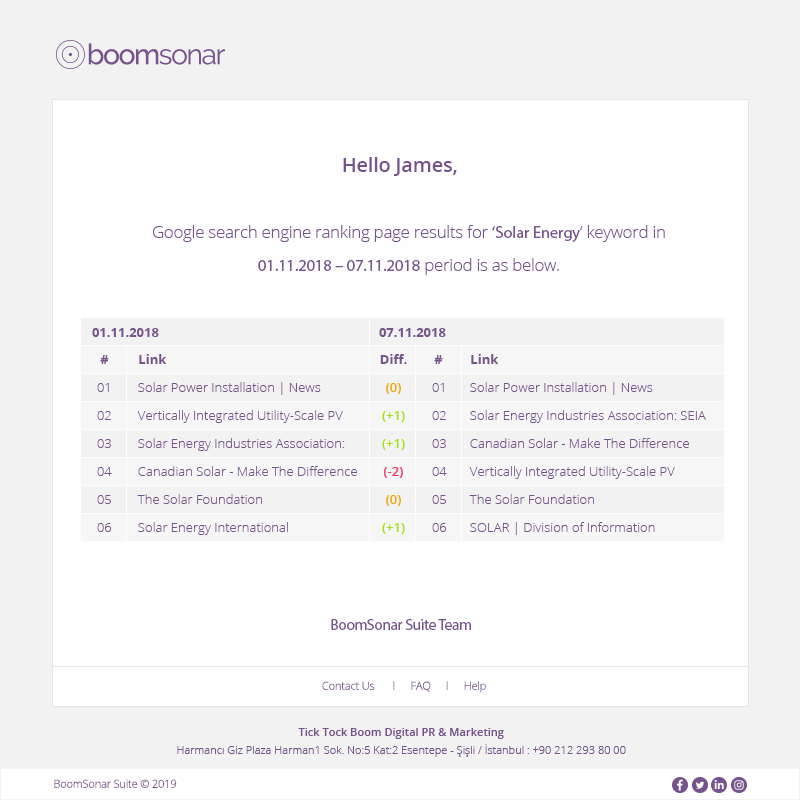 BoomSonar Suite is an integrated social media business platform for web and social media monitoring, social media analytics, social media management and online reputation management. We offer fully integrated digital solutions to companies and leaders, tailored by modern day communication professionals who combine software and marketing experience with an elaborate approach. Copyright © 2019 BoomSonar Suite. All Rights Reserved.